Sorry for the delay in the series of Cebu kuwento. Flickr is blocked in the office (boo!) and then at home, the keyboard is acting up. The Aznar Fastcraft was scheduled to leave by 10:15am. We woke up by 7am, I think, ordered breakfast, and then Marjay and I had a last quick dip at the beach. And we all had dangsilog for breakfast, yum! The Fastcraft was less comfortable -- well, that is, before it started sailing (?) for Hagnayan Port. 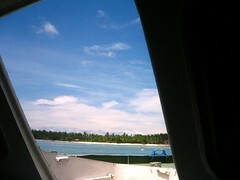 It was kinda hot inside because it was enclosed, unlike on the ferry where we had the sea breeze just flowing inside. The Fastcraft had to move, and you should be sitting near an open window or door or whatever to feel the wind inside. I don't think those seated waaaaaaaay back felt any sea wind at all. We asked to be dropped off at NS Royale Pensione located at Juana Osmena St., in Cebu city. We reserved a Deluxe Room for quadruple sharing for P1750 per night, for two nights. The package includes two free breakfasts. Click here, here and here for bigger images. The Deluxe Room has two double (or was it a queen?) beds, one of them a trundle bed, then a sofa bed. The room is spacious, with two small chairs, a desk, a dresser, two side tables, a small cabinet, and of course, a bathroom and a TV. We also got our own lanai, but we shared it with another room. According to the site, the Deluxe Room "Fits two plus two to four additional persons making it an ideal accommodation for groups or families." and looks like it does. After settling down a bit, we decided to do go to Ayala for lunch, a movie and some grocery shopping. We kinda missed our fast-food in Bantayan, so we headed to KFC to chow down on some finger-licking good chicken! After a very heavy lunch, we decided (and persuaded Poopie) to watch Sukob, the Kris Aquino and Claudine Baretto horror flick. The last local movie I watched was D'Anothers in Robinson's Galleria, and I must say, the crowd in the D'Anothers was not as rowdy and loud as those in Sukob. No, make that, the Sukob crowd was just plain rowdy and loud. That was the first time I watched a movie wherein everybody was fake-shrieking and making hirits. Just like Jessica Zafra experienced. So that Poopie can recover from the Sukob experience, we had coffee and dessert at Starbucks. Man, will you look at that donut! It's freakishly huge and chocolate-y!!! Don't like the peanuts though, because I really don't dig peanuts hehehe. It had choco frosting AND choco filling -- HEAVEN, I tell you. 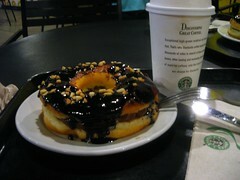 And it's just 40 pesos, the same price as a Starbucks glazed donut here in Manila! The schedule of the Aznar Fastcraft leaving Sta. Fe port for Hagnayan Port was 10:15 am. Better be there on time to get good seats.